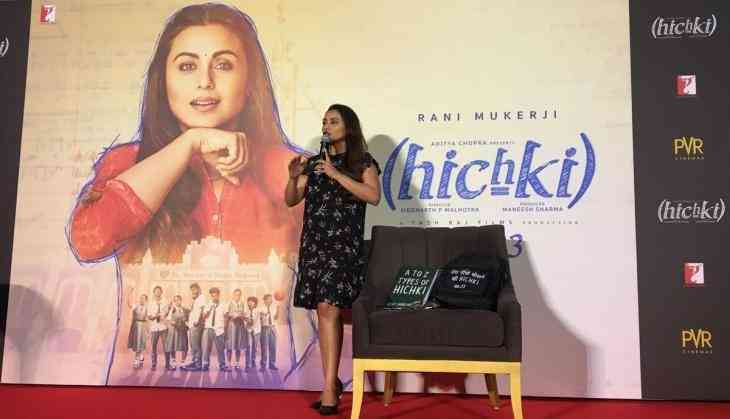 Home » Bollywood News » 'Oye Hichki' song has been released by Rani Mukherjee at her school. Rani Mukerji released a new song named 'Oye Hichki' today at her own school in Juhu, Mumbai. Rani, who plays a school teacher in the film, launched the track in the presence of all her school teacher. The title song addressed the prevalent societal discriminations, in other words - Hichkis, such as a preference for fair skin, partiality towards people with disabilities, females not having the right to make certain choices among others. Written by Jaideep Sahni, the thought-provoking lyrics brought out the whole theme of the social cause. The visuals depict a girl's ordeal faced on the name of prospective marriage. The song also showcases some slum kids and Mukerji shaking their legs at the catchy tunes of the song. The music video is a part of ongoing promotions for the film. The film depicts the life of a common girl played by the 'Mardani' star, who has a nervous system disorder called, Tourette Syndrome that forces people who are suffering from it to make repetitive movements or sounds, involuntarily. In other words, 'Hichki' is about the positive attitude of turning one's weakness into strength, and hence taking challenges head-on.